Community Forums • View topic - HOME FOR THE HOLIDAYS 2015 EVENT! Participate in the annual "Home for the Holidays" event! A gift of v$5,000 to all pilots who land at their home airport using MyAAS. 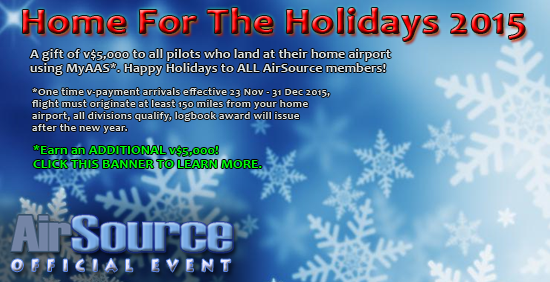 Happy Holidays to ALL AirSource members! One time v-payment for arrivals to your HOME AIRPORT; effective 23 Nov - 31 Dec 2015, flight must originate at least 150 miles from your home airport, all divisions qualify, logbook award will issue after the new year. NEW FOR 2015 - EARN ADDITIONAL AWARD AND $V! 1. Fly ANY bid flight FROM anywhere TO anywhere. 2. Fly ANY scheduled flight FROM where you landed in #1 TO anywhere. 3. Fly General Aviation flight FROM where you landed in #2, TO your HOME airport. *No other flights can be flown between 1,2 or 3 (must be consecutive). Only pilots hired BEFORE 23 Nov 2015 are eligible. DO NOT change your home airport! All pilot data was "frozen" and downloaded as of 00:00 UTC 23 Nov 2015. The home airport you had at that time will be used to determine your eligibility for this event. Re: HOME FOR THE HOLIDAYS 2015 EVENT! I'd like to participate in this event, but I'm having some difficulty finding what my home airport is set as. I didn't see anything in my Air Source profile or in my forum profile. Where exactly could I find this? I am currently flying general aviation flight KLCH (Lake Charles, LA) to KDFW (Dallas-Ft Worth, TX) my home airport. After I was airborne, I clicked on the Home Page Banner - "Home For The Holidays". Have I now superseded my chance for the extra v$5000 (Bid - Scheduled - General Aviation flights) by flying to my home airport first? You will find Home Airport at the bottom of the page. Merry Christmas and Happy New Year to ALL and Peace to the World! I'm a new pilot and i have make a home airport but i don't see my home airport in my profile? and works it also for me this event? 546nm in De Havilland Twin Otter - challenge accepted - honey, I`m coming home 4 holidays! Apparently I wasn't seeing one on my logbook, because I had not previously set a home airport. After I browsed to my home airport (KIND) and clicked the link to set it, then it started to show up in my logbook. Does this mean I am ineligible to participate, because I had not set a home airport before 00:00 UTC 23 Nov 2015? It's understandable if so, I will just need to be on the ball next time around. Will there be an increase in the available Bid flights in the coming days/weeks? I think as long as you do it in the order it was specified, then you will be good to go. Thats how I did it last year. I am on my way to my start location for the event as I speak. I will note in each PIREP which leg of the 3 I am on....thats my take on it. No, because now you can do the bonus flights in the order listed in the announcement. I have looked and looked! I don't have a home airport! Did you set it up when you set up your profile? All: Note that ALL posts in the news forums are by nature required to be "approved" first. This is just the nature of this forum, so do not think it is you or your profile, it's everyone that is not a moderator. Also, if you did not have a home airport set up, e-mail me directly and give me your AS # and home airport ICAO.